We thoroughly enjoyed our stay at the Woodlands. The house is beautiful -- clean, spacious and stocked with everything you would need and more. It sits on 100 acres of a tree farm and meadows and within a short walk to great views of The Straits. The owner Bonnie lives next door and is a gracious hostess who provides suggestions of where to visit in the area. 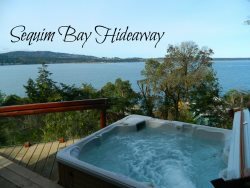 While off the beaten path the house is convenient to Sequim, Port Angeles, and the northeast section of Olympic National Park including Hurricane Ridge, Elwha, and Crescent Lake. Easily accommodates several couples in three bedrooms or a family with kids or grandkids. Woodlands was a great place to stay for 2 seniors and dogs. Well stocked rental that left you wanting for nothing. Super clean too! Property is centrally located between Port A and Sequim with easy access to all area attractions. Woodlands is also off the beaten track on a 100+ acre tree farm with all the room you need to roam. Added bonus is the friendly owner who lives on premises. Very nice older home with a GREAT view of Mt Baker and the Dungeness lighthouse. All sorts of windows on the Strait side, so fun to watch shipping. Two comfortable bedrooms, 2 showers, one bathtub. Good kitchen. Deer visiting every day. Quiet, despite being surrounded by other houses (it's towards the end of a road). Good basic kitchen. Bring your own shampoo. Very roomy and pleasant. The rental company was very professional and I really hope to be able to visit there again. Great Place, all the amenities you can need and then some, clean with clear instructions on how stuff works. We have 2 young boys and they loved being able to go to the creek and run around in the yard. For us it was exactly what we were looking for as far as the Olympic experience. There's some other houses around but you don't see or hear anything. We were there for the Lavender festival and exploring the park, beaches and Cape Flattery. The Park is huge, Hoh is hours away from Hurricane ridge, Rialto and Cape Flattery same thing. All and all the location is as central as it gets. The house is a very pretty 20 minute drive from Port Angeles where you can find everything you need including the ferry to Victoria and some great restaurants. We had a great stay! Lovely surroundings, beautiful well-equipped house--we'll definitely be back! We thoroughly enjoyed No Name Creek. We went up for a week to see the Olympic National Park. It was a great base for us. The area is remote which was exactly what we like. The home was immaculate and a perfect place to retire at the end of a long day. Definitely worth a revisit. Really nicely decorated, super clean and comfortable. Would definitely stay here again. Stayed there with 2 adults and 3 kids. We loved it! The view from all the bedrooms were great with the Christmas tree field and a bit of the ocean. The house was very well equipped with everything you need. I'd highly recommend this property! We arrived to our home away from home and instantly were impressed! The location and house are wonderful!! Everything we needed we had access to and I absolutely love it!!!! Our family of six, all adults, stayed at this beautiful place. The home could not have been more perfect , Extremely well equipped. I really mean anything that you would need for cooking, even a rolling pin. Bonnie even provided extra ice in the freezer in the garage for any day trips you might be planning. We truly enjoyed our time at this beautiful family home. It is a serene and Happy place.